It’s kind of a weird thing to do, relative to the other activities that fill our days. A bit like meditating, an unavoidable question seems to be: “what the hell am I doing here?”. This problem becomes especially acute due to (a) the deterrent pretension that crackles through the air at so many gallery openings and (b) the esoteric, self-referential bubble that the actual work seems to be trapped within. Add to that gooney art scenesters checklisting your scruffy appearance and practicing an eastern religion starts to look a lot more self-explanatory. Looking at architecture is something that’s comparatively simple, if only because it’s a lot easier to make a statement about it without sounding stupid. It seems a given that we’re all entitled to an opinion about the buildings we live in and around -a basic tenet of this very publication’s existence. Architects and their works are somehow easier targets than artists and theirs, primarily because we think we know what the hell it is they’re doing, often times better than they do. There’s a legitimacy, even a moral obligation, in making a very base, or even obscene, criticism about an edifice with a corresponding appearance. And the work of architects seems to have some kind of effect on every moment of our lives, while art must first seduce us or offend us to be noticed in the first place. 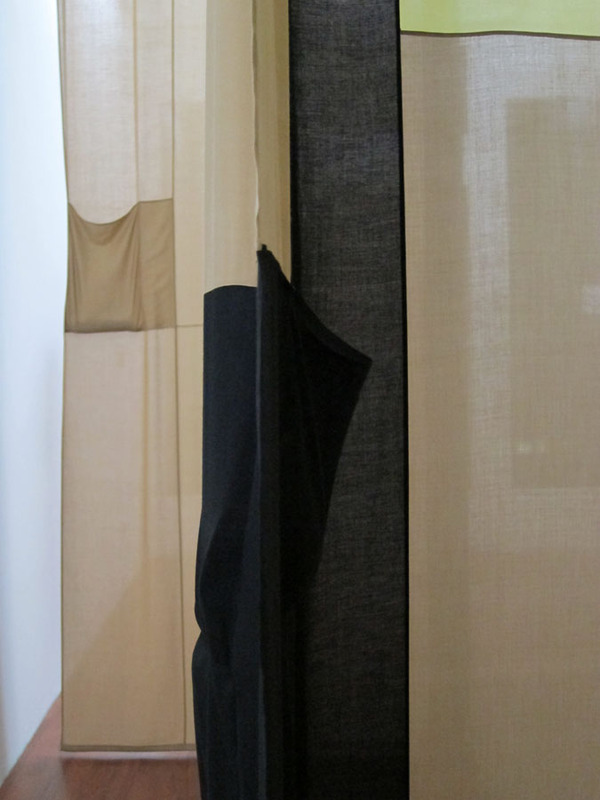 The title of Hella Gerlach’s show up at Studio commands and seduces us in equal measure, and in doing so initiates a necessary rupture from the profanity of everyday life and all the messiness of its architecture, physical and otherwise. This chunk of language is weird and at the same time totally(?) accessible, a kind of textual gateway that might give cause to investigate something that sounds kind of fun. On the other side of an exhalation and a sheet of plate glass is an offering that coaxes a closer look and, following the directive of the title, an emphatically meditative attitude. All of the elements and objects inside are both autonomous and at the same time the constituent parts of a bizarre phenomenal aggregate. The red cabinet, perfectly level, is actually balancing on its spindly legs as precariously as it appears to be…so be careful breathing out! 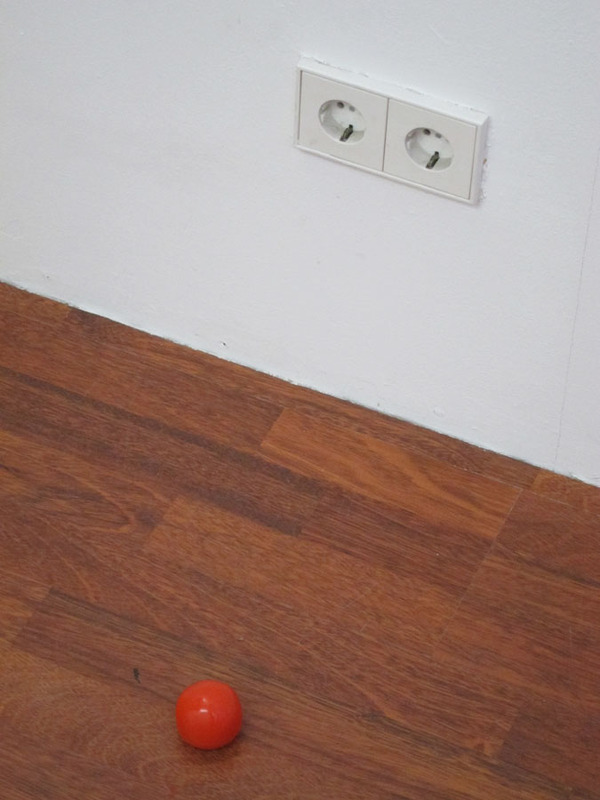 An untitled ceramic ball that was mistaken for a tomato, sits on the floor just to the right of the entrance. 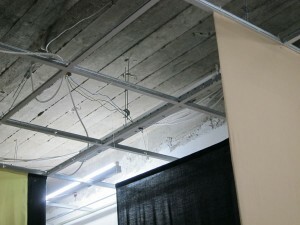 Element I and Element II (Studiolo) are hung from the gridded substructure of the gallery’s semi-dismantled acoustic tile ceiling. 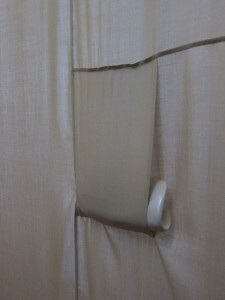 The semi-transparent ramie and viscose fiber walls of the three Element pieces have pockets in which objects were placed. At the invitation of the gallerist, I dug the work Stab out from a pocket on one of the fabric walls. 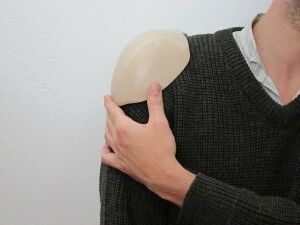 Also made of ceramic, it was uncannily heavy; it felt like a bone until I took it from its sleeve. “Stab” translates to “rod” in English, which is what I first thought the title was supposed to mean. Yet the shape of this thing could definitely be used to put someone into a world of pain. 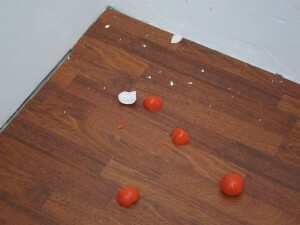 Further into the gallery are three more of those ceramic balls, one of which has been smashed. 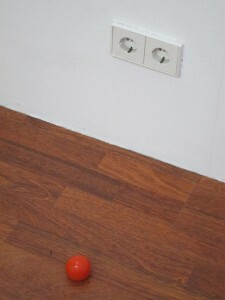 It was actually here that I first realized the ball in the front wasn’t a tomato. It all has something to do with a Greek housewarming ritual, I was told. The attempt was made to smash the balls all around the gallery just before the show opened, but they were fired to such a high strength that three of them survived. were both cast from the artist’s body. But the visitor is free to try them on as well. 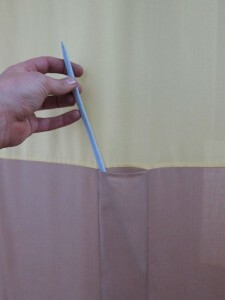 These, I take it, are the “elastic impressions” mentioned in the title of the show. 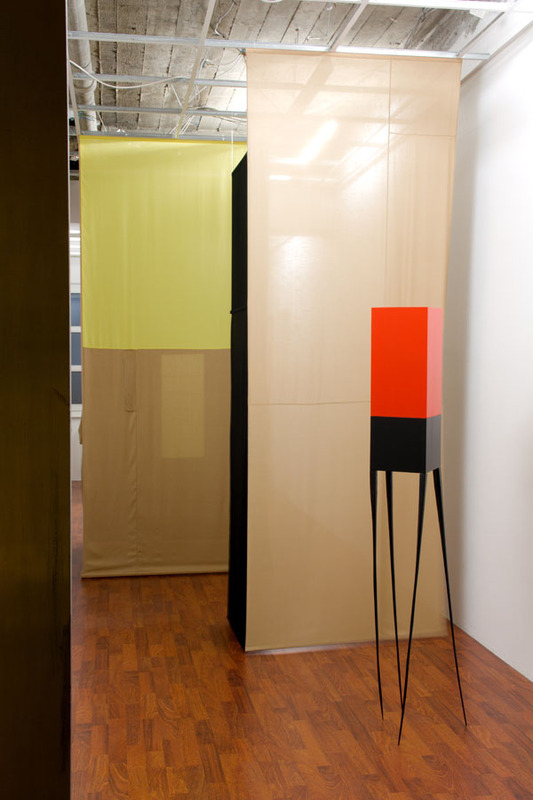 This inconclusive set of objects, spaces and associations is like an architecture of the subconscious. That makes it difficult to talk about in any rational way, but I see the work as operating on the fuzzy line between art and architecture. Like a building, the show doesn’t presume anything of the viewer/occupant; it seems to be actually unable to. A pre-knowledge of what the work is about would if anything preclude understanding it for what it is, I think. 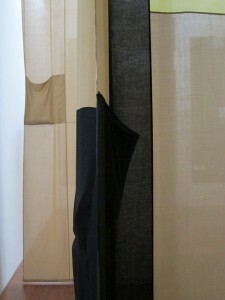 As such, the work operates at a very base level, in spite of its elegance. Something down there, back there, at the beginning of architecture, seems to be making its presence known. Take A Slow, Deep Breath! 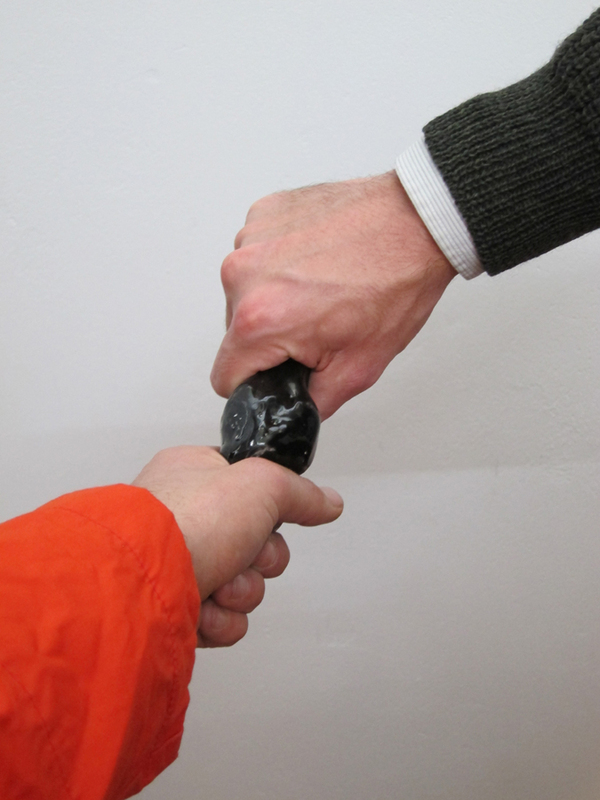 Elastic Impressions is on view at Studio, Adalbertstr.96, 10999 Berlin, until November 26th.